The stock market is still going up. 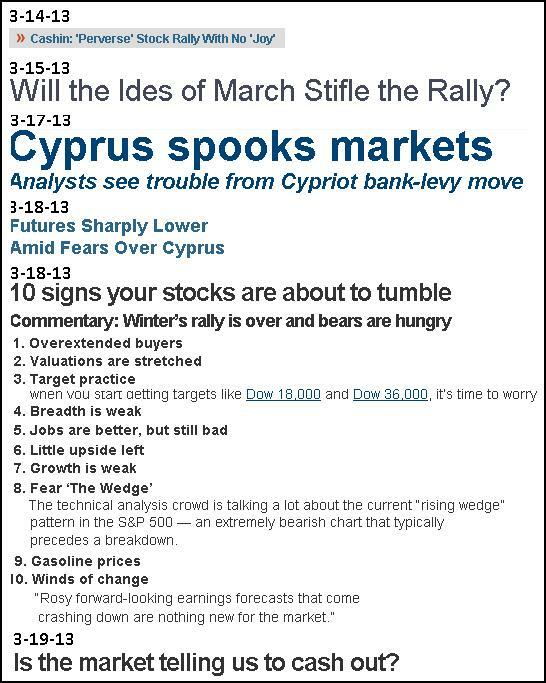 You should ignore all the claptrap about Cyprus, or the idea that because the 1st quarter turned out so unexpectedly (by 98% of the talking heads) strong, the market “must” now be ready for some sort of correction. 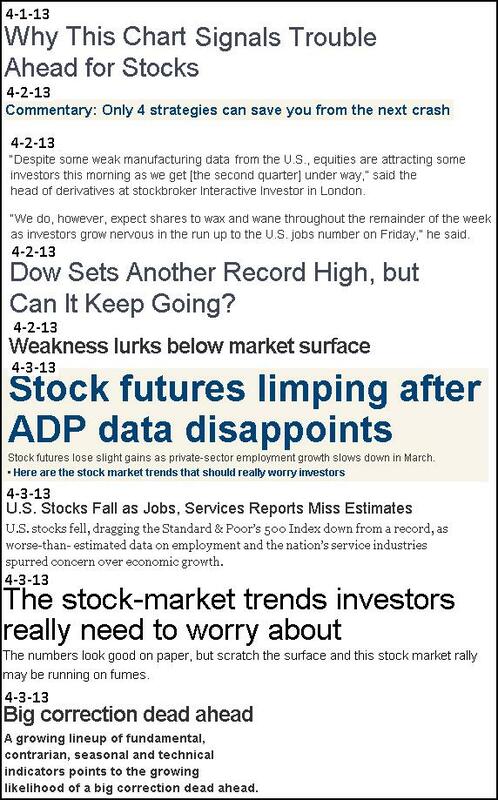 Ignore any talk about any indicators “the economy might be slowing”, and ignore any warnings you should sell because “the public is buying”… I continue to see the stock market as in a potentially explosive mode and would not be surprised to see a 1000 point up week any day now. 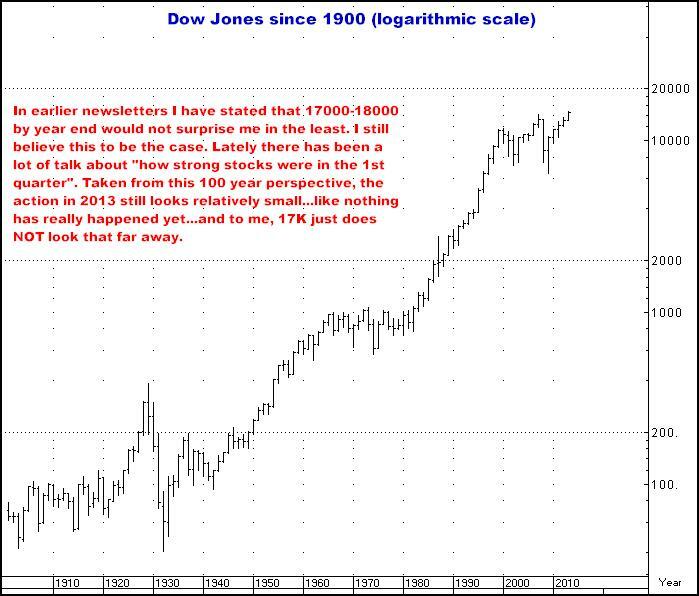 I am still long the Stock Indices and still recommend buying it…right here. Even though the “pros” have had to grudgingly acknowledge that the market has been going up, and even though some bullish prognostications about equities are now beginning to appear in the media, there is still a mountain of opinion, every day, saying “Don’t buy it here”...And as long as that doubt remains so ever present, I will continue to buy the Stock Indices. 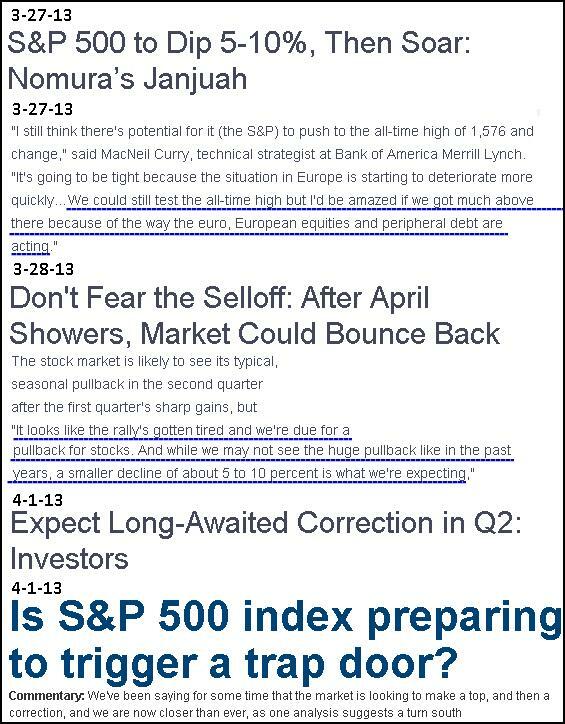 When you can read 50 times a day, “This is the top!” or “The correction is imminent!”, do you really think that is where we are? 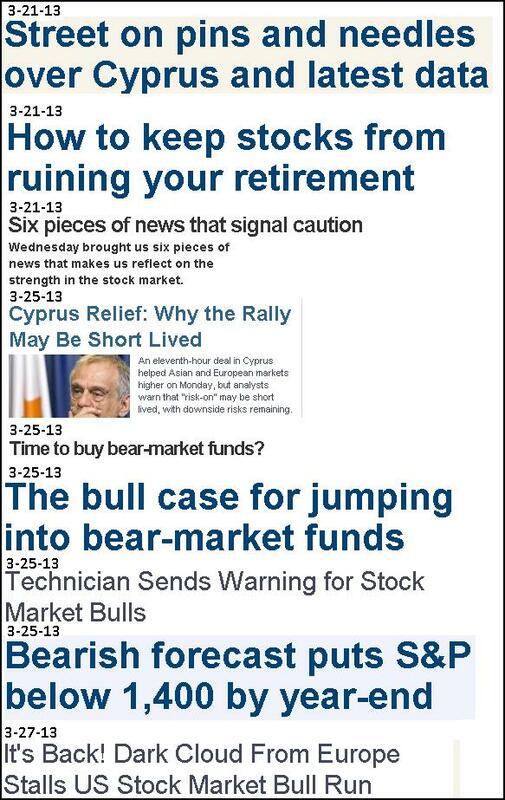 I CONTINUE TO RECOMMENDING BUYING THE STOCK INDICES. 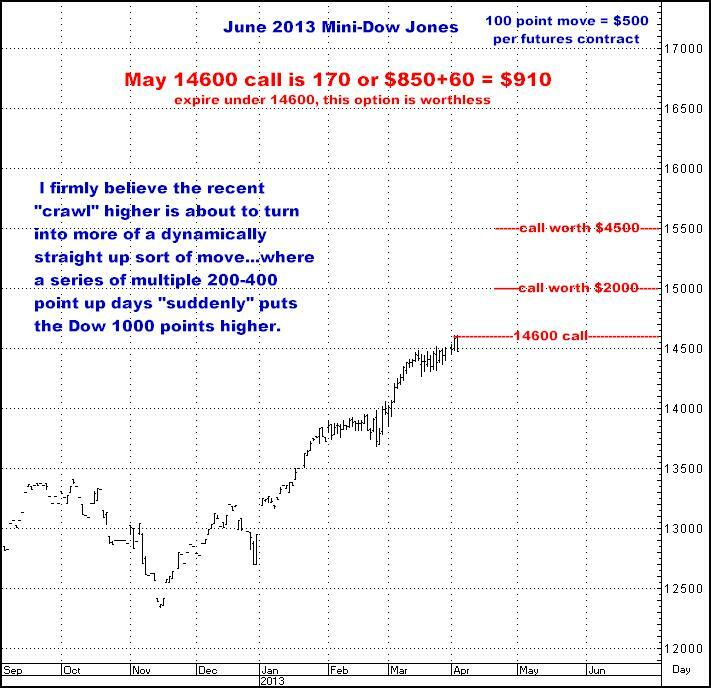 THE MINI DOW FUTURES CONTRACT IS MY PREFERRED VEHICLE. Plain English? 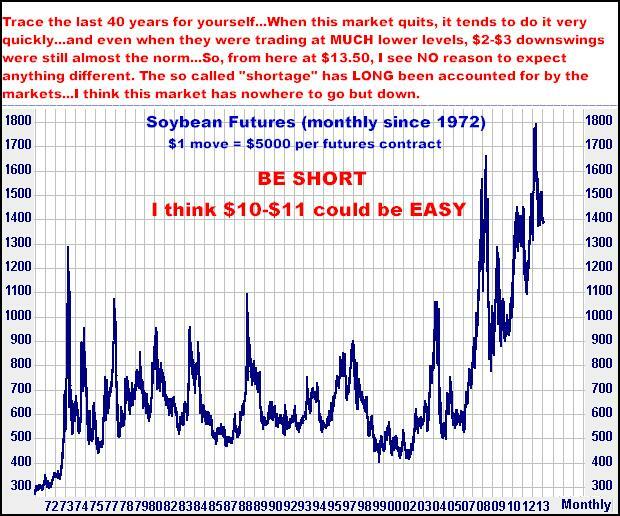 I think all the buyers have bought and the overwhelming majority of sellers have not sold (waiting/hoping/dreaming for higher prices)…and the only way Corn and Soybeans can now go is SHARPLY AND STEADILY LOWER during the next 3-4 months. 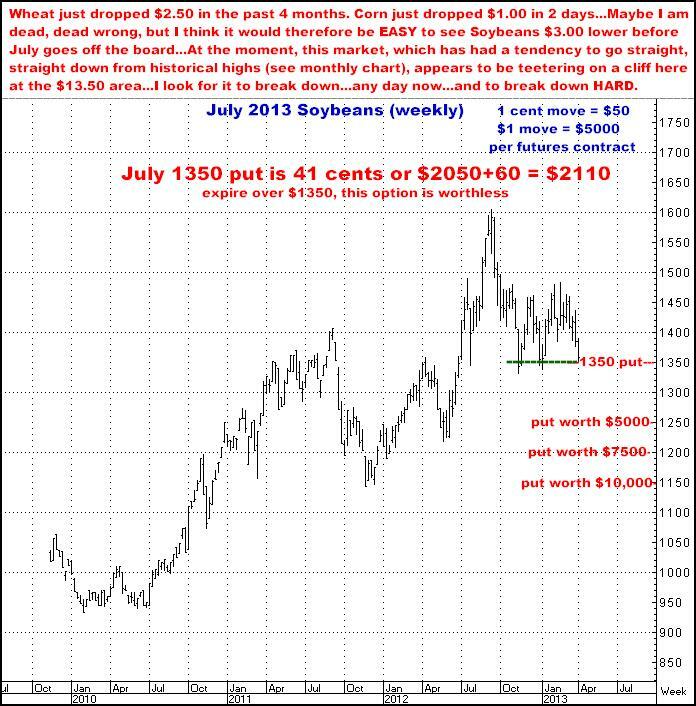 I AM STILL SHORTING OLD CROP CORN AND OLD CROP SOYBEANS…. 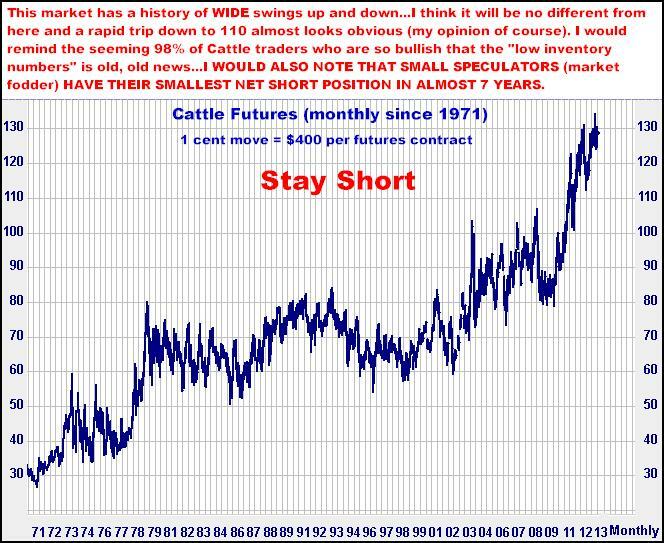 The Cattle market has had an uptick during the past week but I remain on the short side. I continue to believe we will see Cattle trade substantially lower during the next two to three months. 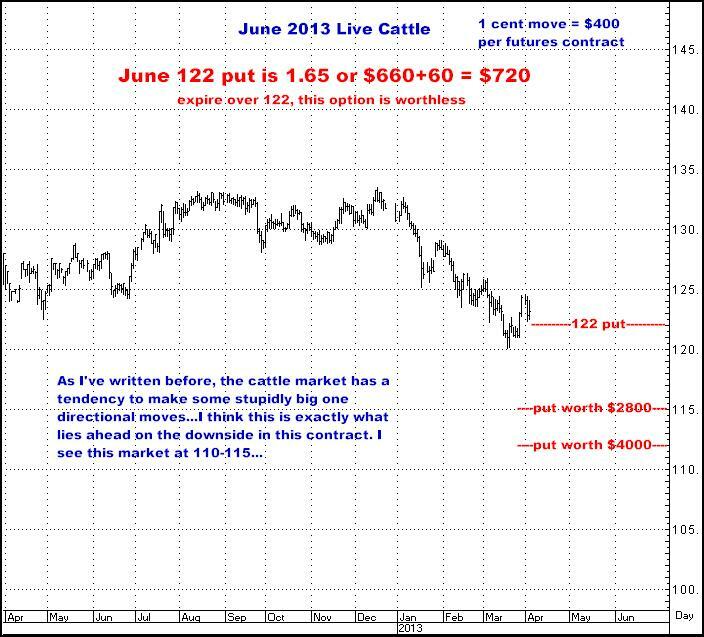 My primary focus is now on the June Live Cattle contract. 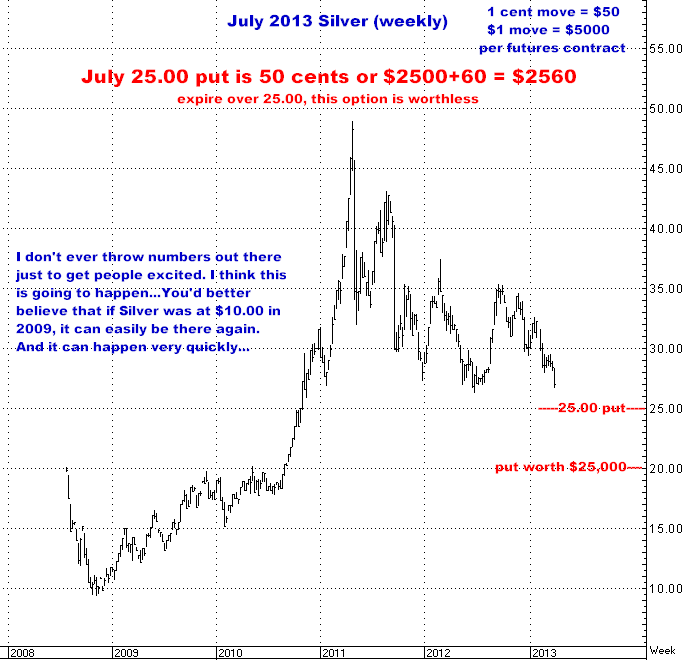 I continue to see the Precious Metals as being in the beginning phases of a many year liquidation. 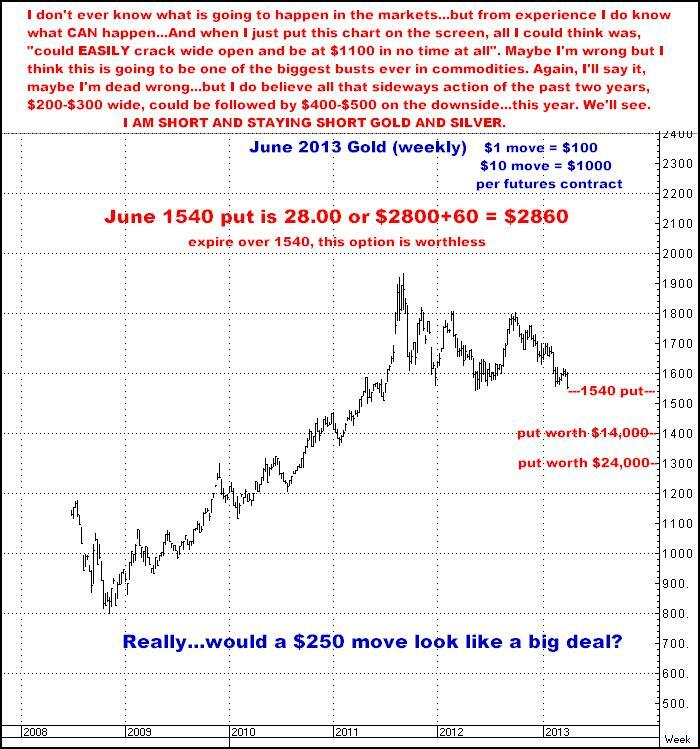 As I have previously written, “Buy Gold” easily became the most popular commodity idea I have seen in my 33 year career…And also as noted previously, in this business, popular ideas tend to lose money (my opinion of course). 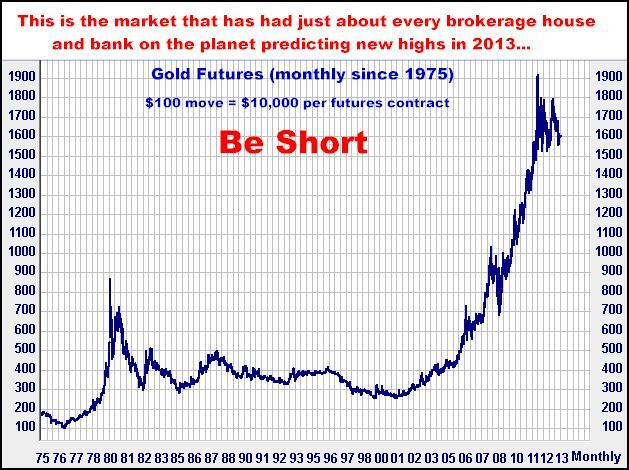 There is no size drop in Gold and Silver prices that would surprise me at all. In my mind, ALL the “reasons” for owning gold have gone totally out the window. The world isn’t falling apart. The international currency system will continue to exist (in other words, Gold WON’T become a currency) and hyperinflation is NOT on the horizon. The precious metals have had their shining moment. Similar to 1981, I see them as being a dead and perennially losing investment for years to come. 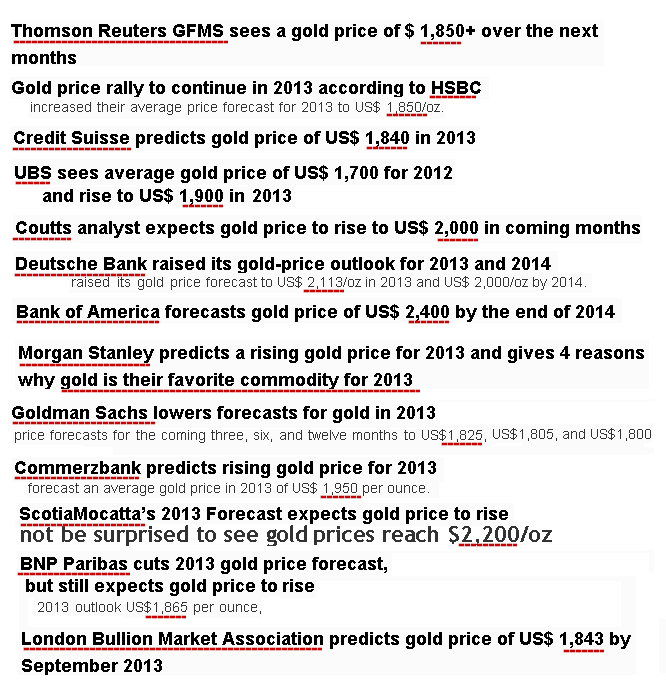 And just a reminder-From my December 13, 2012 newsletter…a reprint of my list of all those 2013 Gold predictions by the supposed experts at banks and brokerage houses…Again…Buy Gold IS the most popular commodity idea I have ever seen…which, to me, is the perfect recipe for disaster in this business. When I made my first recommendations to Buy Cotton last October, I had at least the $1.10 to $1.20 area as a target by sometime late this coming summer. I still think that will be the case but have recently moved to the sidelines in expectation of some sort of sharp downside retracement. 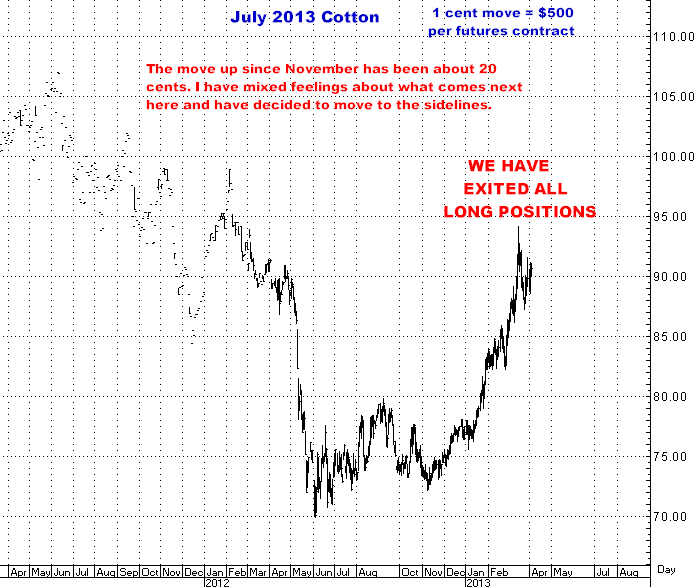 I will comment on Cotton again when (if) I decide to re-enter on the buy side. 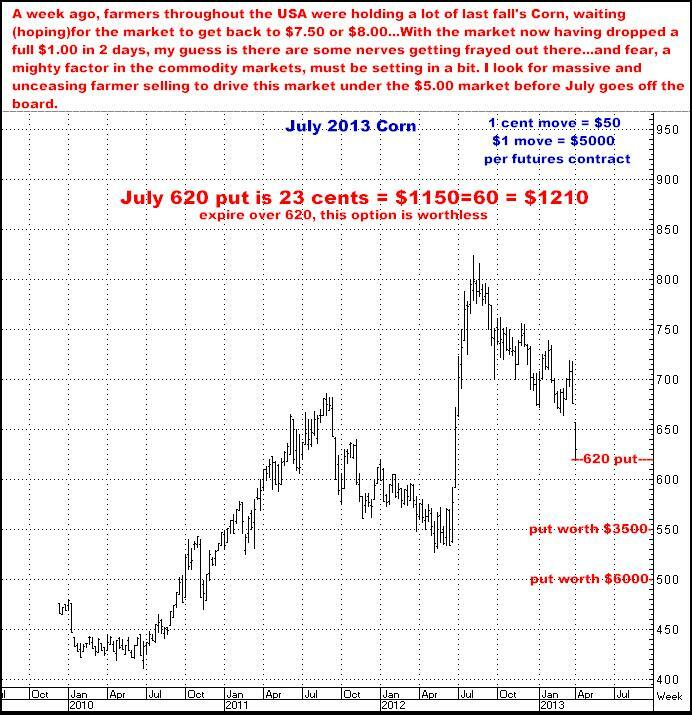 The author of this piece currently trades for his own account and has financial interests in the following derivative products mentioned within: Corn, Soybeans, Cattle, Gold.